Thanks for keeping up with us during 2013! It was a great year, and we're looking forward to 2014 - check out the year in review and our upcoming plans! 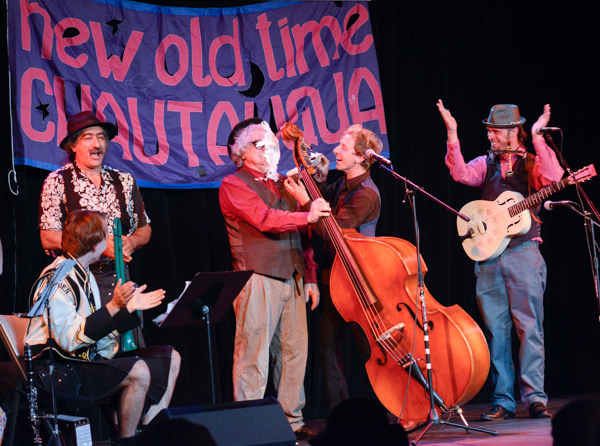 Friday December 6th, 2013, New Old Time Chautauqua is putting on the world's first Vaudeville Hootenanny in a place that is close to our heart, Port Townsend, WA. It'll bring the American Legion Hall alive from 7-11pm with a show by New Old Time Chautauqua and a Dance Party! Vaudeville Hootenanny is a A Scottish New Years Party celebrating the Jefferson County Community and some of its cool non-profits.The show will feature the Flying Karamazov blended with PT natives NANDA, along with many others! Dance the night away to with bands including Tool Shed Trio and the Unexpected Brass Band. On Oct. 25, 2013, Faith Petric, the beloved "Fort Knox of Folk Music" and unflagging, effervescent, big-hearted long-time member of the New Old Time Chautauqua passed from this world at the grand old of age 98, with her daughter by her side and her grand-daughter on the phone from Ireland. A long-time member of New Old Time Chautauqua, and well-known folk singer and political activist, she toured with us until she was 93(!) and always opened our shows with her engaging smile and pulled the audience in with sing-a-longs like "It's a Pleasure to Know You." We were graced by her presence, our audiences were charmed by her, and we'll all miss her. There will be a memorial show in her honor on January 15th in Berkeley, CA. The show is sold out, but it will be streamed live online. See more photos of Faith on Chautauqua on our website. Faith performing at a senior center on the Jambalaya Tour in Mississippi & New Orleans in 2006. On May 19, 2013, Chautauqua ferried over to Vashon Island (near Seattle) for its debut performance at Open Space for Arts & Community. The show was led off, as always, by the Fighting Instruments of Karma Marching Chamber Band/Orchestra and featured Christian Swenson, Sam Williams (aka Smerdyakov Karamazov), Justin Credible, Yippe & Kiyay, Godfrey Daniels, Kevin Murphy, the Flying Karamazov Brothers, and local talent Luz Gaxiola, and Open Space owners Janet McAlpin & David Godsey, longtime Oregon Country Fair-goers and founders of UMO Ensemble, together and as Godsey's The REV. Our 2013 summer tour kept many of us close to home, in Western Washington state. Our original plan was to perform at a string of prisons, in addition to our other community shows. After months of planning and full support from the prison officials, right before the tour the shows were cancelled with no explanation. We scheduled in new community shows, but were heartbroken not to be able to build upon the successful and fulfilling prison shows we did in 2012. Fortunately, the juvenile correctional facility dates were not subject to the same cancellation, and we were able to bring our shows, workshops and joie to vivre to the Green Hill School in Chehalis and the Echo Glen Children's Center in Snoqualmie. A couple of young Chautauquans recently transplanted to the Bay Area are planning a weekend of shows in San Francisco and nearby in late February 2014. Keep an eye on our website or Facebook page for details. Our recently departed crone, Faith Petric, was born in a log cabin by the Clearwater River near Orofino, Idaho. And so, we've decided to honor Faith and her memory by touring this year all around the wild country from which she sprung. 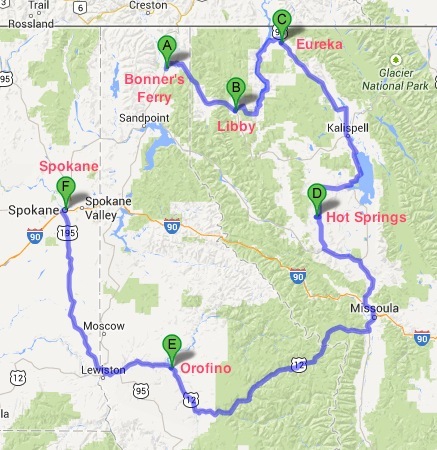 The tour will travel from northern Idaho to northwest Montana, back through Idaho, stopping in Orofino, and ending up in Spokane. Along the way we will be sharing community with youth detention and corrections centers, senior centers and hospitals, while conducting workshops, both ours and local, parades through each town and, of course, finishing with a great Vaudeville show that can't be beat! General information and tour application information will be posted on our website by January 1st - we hope to see you there! We'll be heading out right after Oregon Country Fair (July 11-13) and finishing up around August 4th. 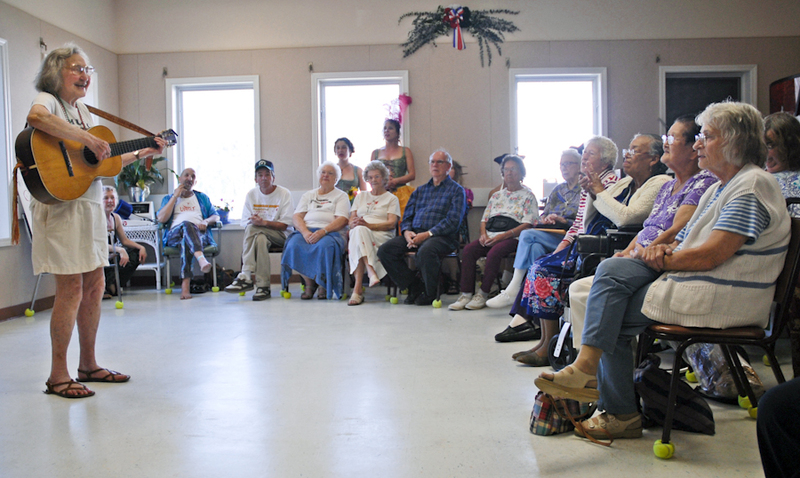 A group of young Chautauquans, inspired by their experiences with New Old Time Chautauqua, and their connection with Dr Patch Adams (NOTC founder) through the group, has created the Emergency Circus. Under the umbrella of Patch's Gesundheit Institute, and modeled like a mini-Chautauqua tour, they will be taking their 7-person troupe on the road to perform at healthcare facilities, homeless shelters, detention facilities, children's centers, and the like across North America They are in the last few days of a Kickstarter campaign to fund their programs - check out the video and project description and help bring our type of entertainment to even more communities! The Kickstarter ends Saturday, Dec 7th at 11:11am EST. "Thank you all SO much for visiting our Clubs and hosting workshops--the kids are still raving about the great time they had! We truly appreciate it & come by and visit us again anytime!" "Thank you for coming to our small town of Concete! My kids and I had soooo much fun!" "What a fantastic time we all had! Thank you!!!" We appreciate the support of our audiences and the communities we visit. Please help us continue what we do by spreading the word, sharing our video, or donating towards our tour costs. We run a very low-budget tour operation camping in tents and feeding our 60-person troupe from our portable outdoor kitchen, but every cent helps us keep the vehicles on the road and the musicians, performers, workshop leaders and tour organizers going! Stay tuned for a project in the works - a traveling kitchen trailer! photos by Michelle Bates, except GRuB. Header photo at Chumleighland, July 2013.